Drive a desert highway searching for buried treasure. 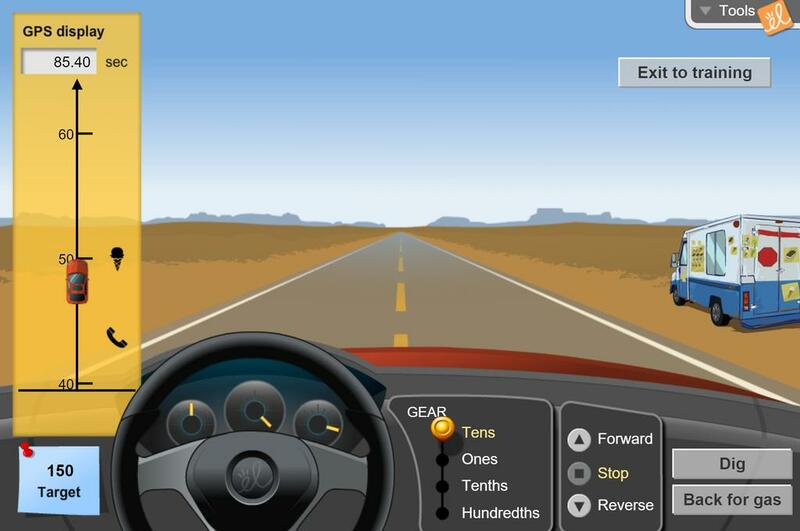 Learn to use the car's tens, ones, tenths, and hundredths gears, along with a GPS system (number line), to find the right place to dig. Plot your find on a zoomable number line map. Can you become a master Treasure Hunter? Locate numbers on a number line. Estimate the positions of decimals on the number line, up to hundredths. Compare and order decimals using a number line. See that, between any two numbers, there are always more numbers. Great way to introduce or review decimals! Nice for decimal place value practice. This is great for teaching place value! They have to change place value to adjust their speed. Number lines are EVERYWHERE in real life! Fabulous practice on number lines with various scales: 10s, 1s, tenths, hundredths.